Allen Mountain is regarded as one of the remotest of the High Peaks. It stands somewhat apart from the other peaks and traditionally has required a minimum 18-mile round-trip hike. It is perhaps also regarded as one of the least favorite peaks, due to the unfavorable ratio of long miles to limited views; Allen bears a wooded summit that offers only narrow glimpses of the surrounding landscape. Nevertheless, it is counted among the 46 High Peaks, and as such it will remain an inexorable attraction. Even if Allen is rarely considered scenic, it is always an adventure. Whether you enjoy the experience or not depends in large part on your attitude. Until recently, the best route to Allen was an unmarked trail that followed a somewhat circuitous route designed to avoid private property. The one-way distance to the summit from Upper Works is 9.1 miles. You can get all the way up and back in a single day, but it might seem like less of a slog if you bring camping gear and camp near Skylight Brook. But that private land is now public property, and there is no longer a need to skirt its edge. New York State has acquired the land at the foot of Allen Mountain, formerly owned by the Finch Pruyn logging company, for the Forest Preserve. Known as the MacIntyre East Tract, it encompasses a long section of the Opalescent and Hudson rivers. But more germane to this article, it also includes an alternate route to Allen that is slightly shorter and noticeably easier. The primary difficulty is navigating the network of logging roads without the aid of signs or markers. From Northway Exit 29, drive west on Blue Ridge Road (also called Boreas Road) for 17 miles to the right turn for Tahawus. Follow this road, County Road 25, to a fork at 6.3 miles. Turn left and continue to the East River Trailhead on the right at 9.2 miles. This “new” route to Allen Mountain differs from the one familiar to most hikers, but it is not radically different; the beginning and end are the same. Nor is it necessarily new. This route has existed for many years, but has only recently been opened to the public. The first 3.8 miles of the hike remain unchanged. From the East River Trailhead near Upper Works, follow the marked trail across the suspension bridge over the Hudson River. Signs list such destinations as Mount Adams, Flowed Lands and Marcy, but a large portion of hikers use this trail to get to Allen. It begins as a soft-surfaced foot trail, but as it skirts around Lake Jimmy, the foot of Mount Adams, and Lake Sally, the route hops on and off abandoned roads with surfaces of coarse gravel. The key turns are marked with brown signs. At 2.7 miles the trail approaches the bank of the Opalescent River, which in the summer is a placid, stony creek. This portion of the trail is once again a gravel road, more often traveled by foot than by vehicle. A gate marks your entry into the MacIntyre East Tract, and everything beyond this point is now state land. The alternate route begins at about 3.8 miles, where the marked trail leads to a crossing over the Opalescent. About 300 feet before you reach this point, a narrow side road leads down to a fording site on the river, very close to the mouth of Dudley Brook. Formerly, signs at this junction discouraged the public from turning onto this route, but any such signs that may remain can now be legally ignored. In the summer, fording the Opalescent can be a welcome interlude on a hot day. The water may be knee deep or more, but feels good on sweaty feet. When you reach the east bank, take a few minutes to check out the scenic clearing about 200 feet north, at the confluence with Dudley Brook. There is an attractive view up the river toward Calamity Mountain. To continue on your way to Allen, follow the continuing logging road southeast. In just 0.5-mile you intercept the main haul road through the property; turn left, northeast. A mere 0.2-mile later, you reach a small hunting camp on the edge of a large clearing, with yet another logging road veering right along the edge of a long gravel pit. This is the route to Allen. Once you pass the gravel pit, most of the remaining route is an attractive hike, and will become only more so as nature reclaims the surface, and converts it into a trail rather than a road. 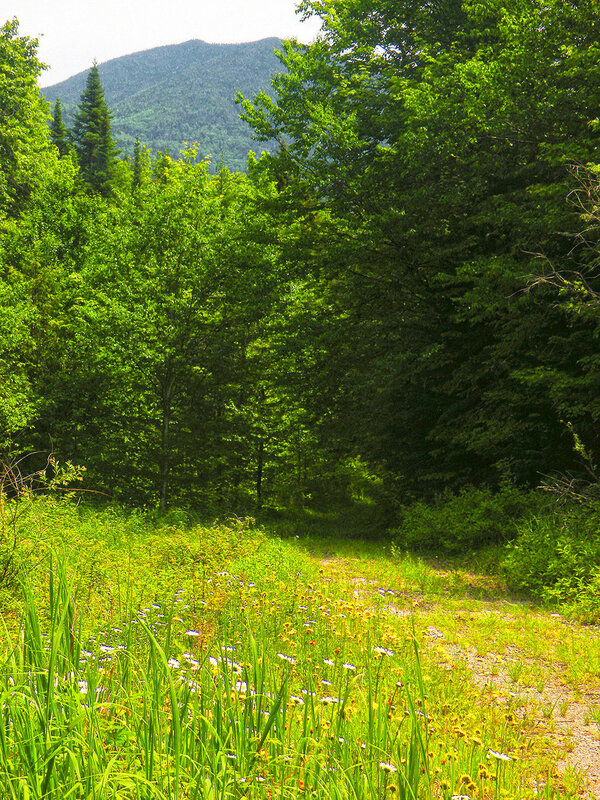 It traverses the foot of the North River Mountains more or less parallel to Dudley Brook, passing a couple small clearings that also once held small hunting camps. It remains a road for about 1.3 miles, at which points it narrows into an ATV trail. (Hunting clubs can use ATVs on this property until their leases expire in September 2018.) At several points you can even see Allen Mountain above you through gaps in the forest canopy. The trail now turns northeast to follow the valley of Skylight Brook. One highlight comes 2.7 miles from the Opalescent, or 6.5 miles overall, where you reach a small beaver pond to the right. If you are willing to step off the trail for a closer look, the waters of this pond serve as a reflecting pool for Allen’s wooded summit. 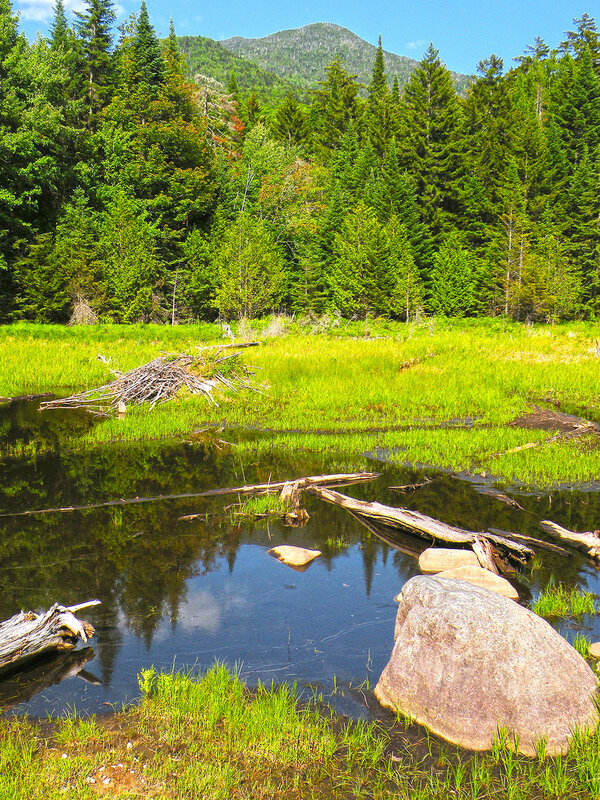 This beaver pond marks the point where the ATV trail becomes a true foot trail. The way is a bit fainter, but it follows a predictable course up alongside Skylight Brook for another 0.5-mile to intercept the main hiking trail, the one that bypasses MacIntyre East. From this point forward, the two routes are identical: continue along Skylight Brook for another 0.5-mile, at which point you reach Allen Brook, and turn to follow it all the way to the summit. Portions of the climb are on bare rock, notorious for the red algal growth that can make the footing slippery. There are no clear views from the summit, but there are notable glimpses of White Lily Pond and Boreas Ponds to the south, and Panther Gorge to the northeast. This route is 8.6 miles long, only 0.5-mile shorter than the bypass route familiar to most people. But the road through the Dudley Brook valley is more level and allows you to set a brisker pace, with the potential for far more camping options in the future. Bill Ingersoll of Barneveld is publisher of the Discover the Adirondack’s guidebook series (hiketheadirondacks.com). For more information on this region, consult Discover the Adirondack High Peaks.